Little Greene | Transform your experience of a space! Daringly, we’ve used an inky blue and mustard yellow (named Juniper Ash and Mister David). 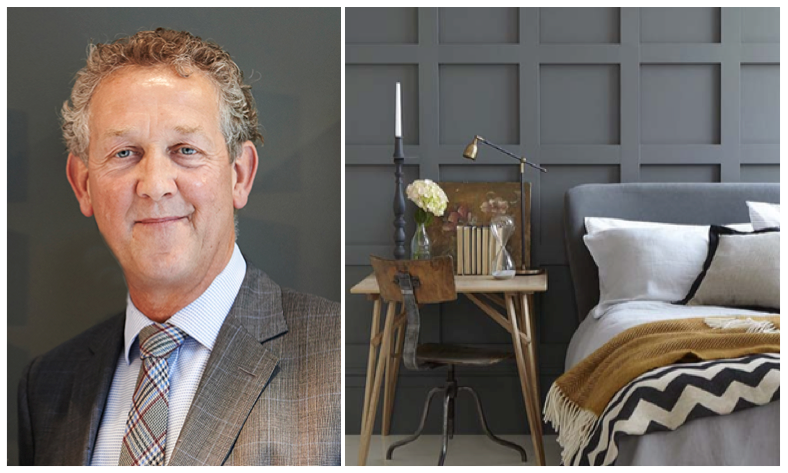 Mister David is described on the Little Greene website as ‘our brightest yellow which has been used to capture the sun in French country kitchens’ and Juniper Ash as ‘a gorgeous blue, with warmth and intimacy, without being overwhelming by its presence’. The interest and character these colours give our 1970s bungalow is impressive. We have very few original features to speak of so it is light and colour that’s going to give it its ‘feel’. You’re in safe hands with Little Greene; as many as eight different pigments are used within each shade and this gives each colour unique depth and subtlety to the eye. The power of this paint is not to be underestimated! You have some fascinating short films exploring the development of a Little Greene colours on your website – how do you choose your palette of colours for ranges? The colour range is based on historic colours that have been discovered in our research with English Heritage. English Heritage approached Little Greene in 2003 with a view to undertaking a project to identify historic paint colours from archive information and to produce close matches to these colours using modern pigmentation (thereby avoiding toxic pigments which had been used historically). Their commitment to thorough research matches ours in beliefs and values perfectly and a small donation out of every pot sold is made to them towards the valuable work they do in preserving our cultural heritage. On top of this solid base we add other colours to ensure that the offer is compatible with contemporary schemes and Fashion couture. However many of the historic colours such as French Grey and Lead Colour are still favourites with modern interior designers! Hick’s blue is my favourite shade now which was chosen by the famous English interior designer David Nightingale Hicks for use in his bold designs in the late 1960s. Known for being eco-friendly, what eco credentials do you hold closest to your heart? The eco credential I hold most closely is the one of product quality. By producing a very durable and long-lasting paint we give the best result with respect to ecology. By contrast a product that fails after a short time has wasted the resources and energy put into it. What changes have you seen in the world of paint in the last few years? How does fashion play its part in the popularity of your colours? The use of grey in the last couple of years has changed decoration style away from warmer tones of ochre and beige. Haute couture plays a major part in creating ‘eye acceptability’ for new colours and different colour combinations. A good example of this is the use of colour blocking which started in haute couture and is now mainstream in interiors. What tips would you give to people wanting to be brave and use multiple colours in their interiors through the use of either paint or wallpaper? Everyone has the ability to put colours together, when you see two colours side by side which are going to be successful they will ‘sing’ to you. Having chosen sample pots of your colours check them out in the room – if they still ‘sing’ to you, you’ve made a good choice. ‘Be bold and avoid the temptation to ‘bottle out’ as colour can transform your experience of a space’. So with this advice ringing in our ears we turned our attentions to our hallway. Obvious and necessary works were carried out first (artex ceiling re-plastered, ugly light switches replaced, 1970s external glass door replaced with a solid wooden composite from Todd Doors and a Velux installed to flood the space with natural light). Practically speaking we removed the secondary door, added lots of inexpensive bright hooks from Toughook (see here) but retained the original bespeckled side glass panel as a reference back to the 1970s heritage. We built floating storage plywood boxes creating a ‘seat’ to sit at and pop on shoes. 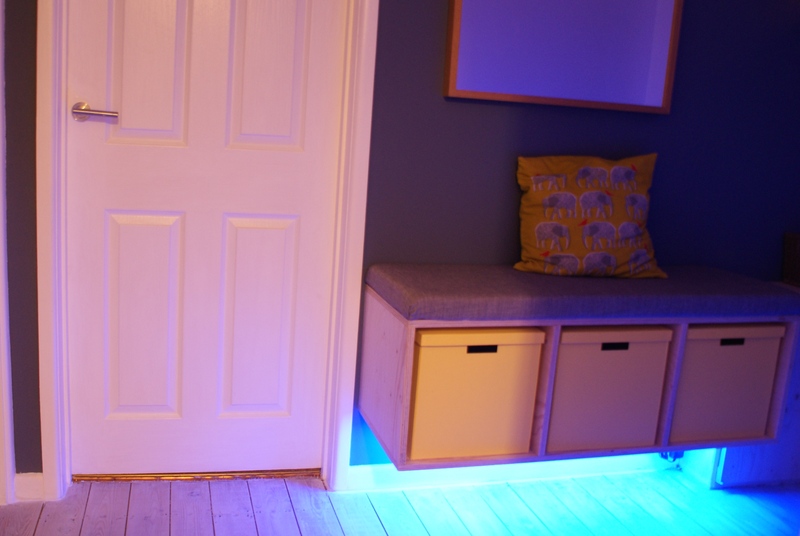 For just £18 we also bought a remote-controlled LED strip light which you just stick to the underside giving you brilliant colour combinations and mood lighting in the evenings. Sanding the floor and liming was inexpensive, quick to do and bounces the light around rather than having a carpet saturate the light and collect dirt! 1. Colour on the walls! We believe this particular colour combination appeared in the BBC’s Great Interior Design Challenge in Series 1 Episode 5 when a designer madeover a kitchen in a 1960s span house on a modernist estate in Surrey. It suits modern living yet harks back to a mid-century aesthetic. We colour blocked the space in order to inject movement through the property and then picked out objects using the respective colours to tie them together so you experience a succinct ‘journey’ through the space. 2. Investing in quality items you use on a daily basis: ironmongery, flooring, a runner, seating, mirror and eco lighting in warm complementary colours. 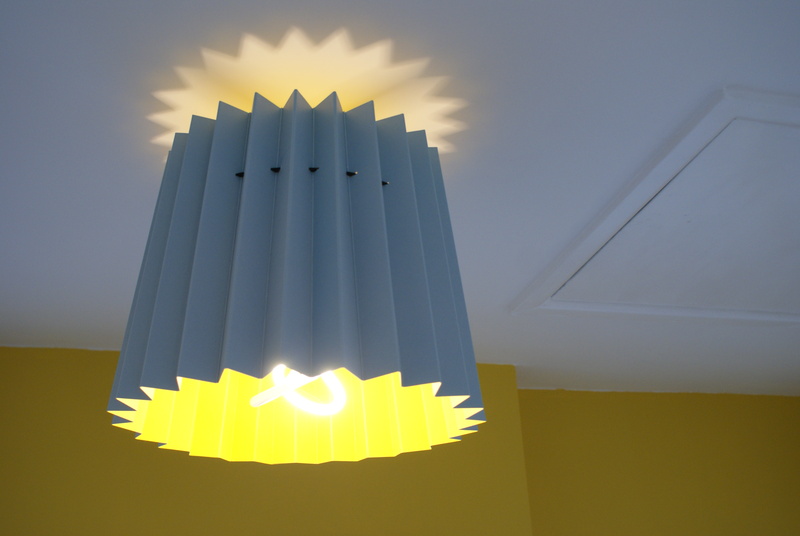 Large striking lampshades in complementary colours. Our playful two-tone lampshades are the crowing glory; a collaboration between Little Greene and Lane there are six colourways to choose from. 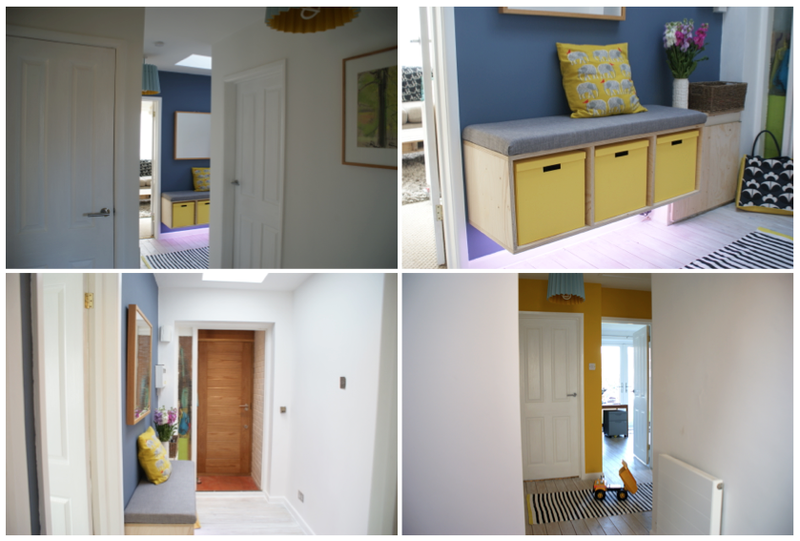 We selected ‘Brighton’ and ‘Mister David’ to highlight the yellow on the wall and bring a continuation of the colour scheme through the hallway as the underside is this same strong yellow! These lampshades are available now and are a result of a chance meeting when Lane met Little Greene at Design Junction during London Design Week in 2013. The similarity of their brand philosophies and commitment to British craftsmanship resulted in the project – you can find out more about this collaboration next week! 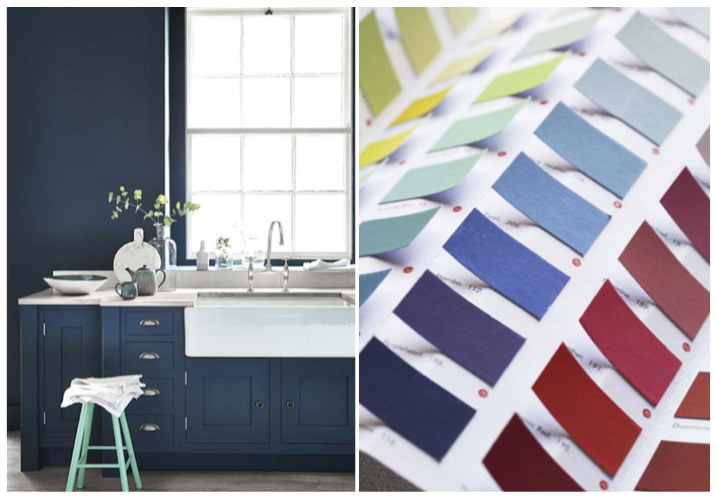 So in sum, if you are planning a renovation then we fully recommend using Little Greene paint. It doesn’t smell (none of those nasty odours), you can buy sample pots for the full range and the quality is such that a little really goes a long way! Check out the range HERE and keep up to speed with their news, collaborations, events and competitions by following them on Twitter, Facebook and Pinterest. Happy painting! Apologies! Seriously overused word alert……but the hall is ‘transformed’! I can’t believe what a difference those colours make to the feel of the interior…looks like a room now rather than a thoroughfare! Love it!